All 3 tiers are strawberry cake with buttercream filling. Crown, bow and star are made of gumpaste. You can't see it in the picture unfortunately, but the star on the crown and the one on the wand and also the whole name plate have sparkly iridescent edible glitter on them and when the light hits it, it's so beautiful and sparkly! I wish the camera would have captured it. 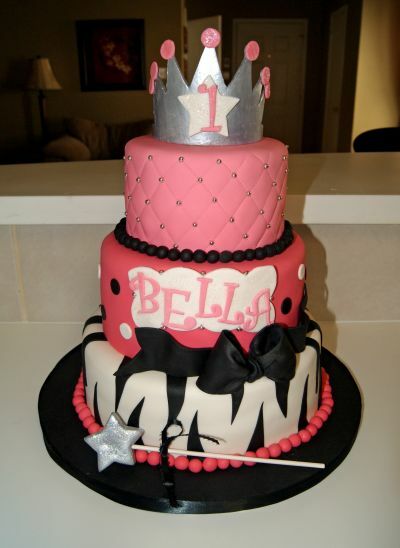 =/ Bella's mom came up with the design and I think she did a great job!